Whether Slocum was more accomplished as a writer or sailor is hard to say. His writing style is fast paced, witty, and exhilarating, an absorbing match to his harrowing adventures - adventures that included being chased by Moorish pirates off Gibraltar; escaping a fleet of hostile canoes; being submerged by a great wave off the Patagonian coast; an encounter with Black Pedro, “the worst murderer in Tierra del Fuego”; and foiling a nocturnal attack by savages by strewing carpet tacks on the Spray’s deck. Captain Joshua Slocum (1844–1909) was the first person to circle the globe alone entirely by sea. This remarkable achievement made Slocum the most famous North American sailor of all time. Beautifully written, delightfully understated, with a gentle humour Joshua Slocum recounts his great adventure. The days of sail are being replaced by steam and one man rebuilds a small small sailing ship and sails alone around the world. Throughout he honours his sloop The Spray and recounts her charm in calm and tempest alike. While a few have indeed followed his lead, this is a great listen to a book recounting the voyage completed before 1900. As a long-time consumer of recorded books, I’d rate Sailing Alone Around the World as one of the most enjoyable examples of the genre that I’ve ever encountered. By the time Captain Slocum had laid the deck of his aptly named schooner, the “Spray”, in Chapter One and launched her into her natural element, I was completely hooked and my admiration grew throughout the book. Slocum’s narrative style – direct, unaffected, informative – along with his self-deprecating humor, reminded me of another American writer named Samuel Clemens, and it engenders the same feeling of likability. Captain Slocum would surely join Mr. Twain, as one of the ten people I’d most like to invite for an evening of dinner and conversation. Slocum’s account of his voyage is an intriguing blend of introspective, travelogue, and adventure. Contrary to what one might expect (particularly a non-sailor like myself) the captain spent a great deal of his time at sea reading in his cabin, leaving the Spray to find her own way. This wasn’t as reckless as it might seem. Far from land and the major trade routes, with many fathoms of water beneath her keel, a blue water sailor like the Spray could cruise safely and reliably for mile after mile without a hand at the wheel, maintained on her course by the balanced impulses of wind and water on sails and rudder and hull. An experienced seaman like Joshua Slocum could remain comfortably below decks, out of the elements, and read – or even sleep! – confident that he would sense any significant change in conditions or the behavior of his craft. This is evidently what he did during many long stretches, which answers one of my more pressing questions. How did a man with his modest educational background, who had spent most of his adult life working at physically demanding jobs, become such a graceful, imaginative, and appealing writer? The answer is that he learned by reading great writers who had preceded him. Only a few specific titles in his library are mentioned, and these are primarily classics of nautical literature; but it’s evident that Slocum stocked his tiny cabin with scores, if not hundreds of books of all kinds, replenishing these with new volumes whenever he had an opportunity. The results of this immersion are obvious in almost every line that he wrote. Indeed, I’d be pleased to be judged half the writer that Slocum became in his later life, when this book was written. Slocum stopped frequently during his voyage in ports around the world, often remaining for prolonged visits, during which he explored the countryside, sampled local culture, and met a variety of native people, as well as expatriate Americans and Europeans. His journey took place at the end of the nineteenth century, during the last heyday of European colonialism. Consequently, as news of their endeavor preceded them, Slocum and the Spray were welcomed wherever they went, particularly by elements of the world’s great navies, which maintained bases in many foreign ports. As a result, Slocum rarely paid port fees or docking charges and was frequently provided with repairs to his boat, as well as provisioning at no cost. On a number of occasions he was even towed by naval vessels, whose captains were only too glad to help him out of difficult situations. Far from sleeping aboard his vessel in port, he was routinely entertained, often in grand style by ambassadors, port officials, and other representatives of European power, anxious to demonstrate their good will toward this adventurous Yankee. 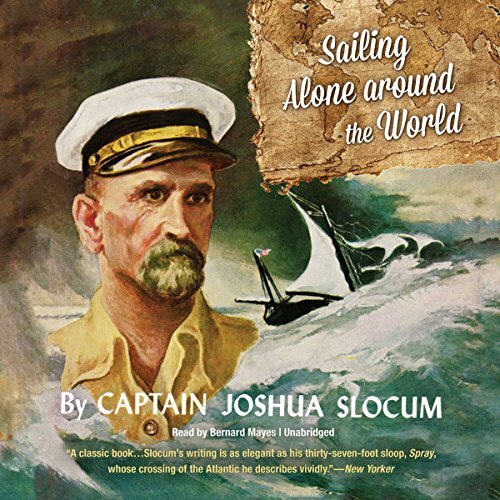 One couldn’t do this sort of thing nowadays, when sailing around the world is almost a commonplace; but Slocum was the first ever to undertake a solo circumnavigation and the people he met, especially sailors and naval personnel couldn’t do enough for him. It must have been delightful; but, to his credit, Slocum didn’t allow special treatment to go to his head. The modesty and good humor that are evident in his writing must have been reflected in the way he behaved in life, and these characteristics seem to have ingratiated him with everyone he met. This is not to say that sailing a small boat single-handed around the world was either easy or uneventful. For every pleasant interlude that the captain spent relaxing in some friendly port, there were harrowing, often life threatening experiences that taxed nerve, wit, and resolve to the ultimate degree. He was obviously a man of considerable physical strength and endurance, not to mention exemplary seamanship, yet on many occasions these qualities were barely enough to ensure his survival. In fact, without considerable luck to go along with his other resources, Captain Slocum and the Spray might never have made it back to New England. Through it all, whether battling mountainous waves to outrun Barbary pirates, clinging to the Spray’s masthead, while the entire boat vanished beneath roiling seas, or threading his way through the deadly shoals of the Magellan Straits during a night of gale force winds, Slocum retains the stoicism and calm acceptance of a man who is used to hard knocks and strenuous exertion as a part of everyday life. If his descriptions of events weren’t so vivid, one would hardly know how often he escaped disaster or even death by the thinnest of margins. By the time he anchors the Spray in his home port after more than two years of sailing over many tens of thousands of miles of the world’s oceans, it’s clear that he has taken us on one of the most extraordinary adventures in the history of the sea. Performance art is an amalgam of the writer’s original conception and the performer’s interpretation of it. The combination isn’t always a happy one, but in this case it works perfectly, which is actually rather strange. Joshua Slocum was a Yankee, born and bred, so we can assume that he spoke with a typical Yankee inflection. Since he wrote his account in the first person, one might think that having someone with Bernard Mayes’ aristocratic English diction narrate the book would seem incongruous. This is not the case. Mayes’ rendition is pitch perfect in both tone and style; and his accent is so pleasant that I’m not sure I would like the book as much, if it were read with a more “authentic” northeasterner’s twang. As a matter of fact, I’m considering buying several other audiobooks simply because Mr. Mayes is the reader. I finished listening to Sailing Alone Around the World a couple of months ago with that curious mixture of pleasure and regret that attends the conclusion of memorable experiences. I can't exaggerate how much I enjoyed the book, especially in audio format, and I recommend it unreservedly to anyone who likes a good yarn, expertly told. If you like nautical adventure, this is a good one. The writing is wonderfully dry and funny and this is very aptly enhanced by the English narrator, Bernard Mayes. The narration is very matter-of-fact and one travels alongside the author as he discovers that Barbary pirates are chasing or he is having tea with Robert Louis Stevenson's widow in a remote Pacific island. There is no reason not to give it 5 stars - IF you like a Victorian sensibility. A wonderful tale, told without pretension and always with delightfully modest good humour. Capt. J Slocombe comes across as a hugely like able character whose modesty clearly belies his incredible skill and courage. The narration is sensitive to the story and delivered in a voice that is very believable as that of a wise old sea Captain. It's hard to imagine a more engaging book. I read this many years ago, but somehow the audio recording made it come alive all over again. It's extraordinary to think that A mariner with such skill as to sail alone around the world also proves to be one of our great writers. The book is written with humor, wit, a philosophical bent, and above all a great sense of adventure. It is a triumph of humanity, as well as of good storytelling. This is a book for the ages. Download it now, it's a book you'll remember all your life. You are there. Feel the sea breeze, hear the waves against the hull, taste the sea air. I will read / listen again and again some more when I need to escape. I reminded me some of Neville Shute's stories. A guy buckles down and slowly and surely gets the job done, in this case, sailing alone around the world. No brag, just fact. I enjoyed it. The narration does sound a little like it was recorded in a can, but narrator is good. Voice actor is an interesting choice. Great voice but I wonder if the accent is close to the author's, this is an autobiography. Anyway, very interesting story about the Captain's voyage and life leading up to it. Thoroughly enjoyed. True tale of human spirit and adventure. Should be a movie in my humble opinion. Great story and great narration. Slocum really comes alive in this reading, and whilst mostly accurate, it’s fun spotting the bits that are embellished to make a wonderful story even better. Highly enjoyable. Stylishly written, charming, and witty. I really enjoyed the authors sense of humour. It comes out again and again. He has a lovely relaxed style of writing that is enhanced by the narrators voice. I felt like I was gliding round the world on the wind with him. It was a bit light on detail. I would have been quite happy for it to have been double the length. One of the most enjoyable, and stylishly written books I have listened to on audible. A hidden gem, and a book anyone would enjoy. the story is fascinating, though at times it is challenging to follow owing to its period of origin. A diamond among adventure stories. In 1895 and at over 50 years old, Joshua Slocum set off to sail around the world - oh yes, after first having (re)built the boat he was to sail. No one had ever done this before. Despite this amazing feat by a truly remarkable man, who obviously re-drew the boundaries of the possible, this book is easy to read, funny and filled with observations of and encounters with a world which has long since disappeared. The writing is simple but brilliant and focussed not on sailing tech stuff, but on the story. The whole thing is understated and accessible and I'm surprised that he and the book are not better known. It is narrated by a Brit - I am one too, so this is not anti-British; however Slocum was a Canadian sailing under US colours and the language does not quite fit being heard in this accent. The narrator does a good job and mostly I forgot this. A true gem - you won't regret it. Classic adventure recounted in fine understaded style. Full of humour honestly and just a great story. told with subtle sense of humour and a window to another time. old slocum must have quite a guy. I really enjoyed the story of slocum's experiences.